Be part of this 3-day extravaganza that will showcase products, services and even artworks of fashion and fitness entrepreneurs, practitioners and talents. It was conceptualized to further develop and expose their products and services to the public and be recognized in the fashion scene – making this the annual trade event for style, health and wellness. Parts of the event are fashion shows, workshops and seminars, music production and other exciting activities that will not only give entertainment but enhance the learning of the public with regards to fitness and fashion issues as well. If there’s one cardinal rule in fashion, it’s innovate, innovate, innovate. To remain a true fashionista at the forefront of fashion, it's imperative that innovation be a way of life. That’s why style-conscious individuals should remain on the lookout as cult brand Havaianas introduces its newest contribution to Philippine fashion. Havaianas invites Pinoy fashionistas to be among the first to discover its latest fashion statement, anchored on the multifaceted, chic and trendy lifestyles of Filipinos. Log on to www.havaianasphilippines.com/musthavs on October 7, 2009 at 6:30 pm, and be part of the historic unveiling of a fresh fashion must-have by Havaianas through a live online streaming - the first of its kind for the category. So save the date, stay on top of the hottest fashion statement and experience Havaianas in a whole new way. Buy original Havaianas only at authorized retail outlets. Havaianas is available in All Flip-Flops, Aloha Boardsports, Celio, J&S Surf Shop, Manila Polo Club, Moana, Nail Spa, ROX, Rustan's, Sepatu, Souk, Stoked, The Zone, Orange Juice, and Kidsports. For provincial outlets, visit www.havaianas.com. * 30+ Exhibitors and vendors showcasing products and services for kids of all ages. * All day talks and demos for moms, dads and kids at the stage area. For the whole day there will be a pet print stamping “Peace Board” for both owners and their pets who want to show their support for peace. Water soluble non-toxic paint will be used for the paw prints while owners can sign their names beside their pet prints. Also in the morning are LGU Taguig’s opening remarks, inspirational talks from the Department of Health and Department of Agriculture, guest speakers, and the ceremonial raising of Campaign Banner. Expect free vaccination for pets. There will be sponsor booths that will provide human and pet foods for free, lootbags, exhibits and different activities. Pet Club activity will also take place in the same venue in the afternoon. We will introduce more games and learning exercises for the dogs as well as give prizes. Late afternoon till evening, we are going to have a free RAPID concert. Bands: Giniling Festival, Zelle, Gupit Binata, 10 Story fall, Penguin, Insanar, Cryogenicz Sleep Band, Bittersweet and Mayonaise. Included as well is the candle lighting ceremony. Hope we see you there and your dogs! George Optical is Giving Away Shopping Sprees! THERE'S NOTHING BETTER THAN TO SHOP ‘TIL YOU DROP SEE AND SPREE!!! 1. Patients will be entitled to a raffle coupon for transaction worth PHP 3,990.00 in a single receipt outright and concessionary. 3. 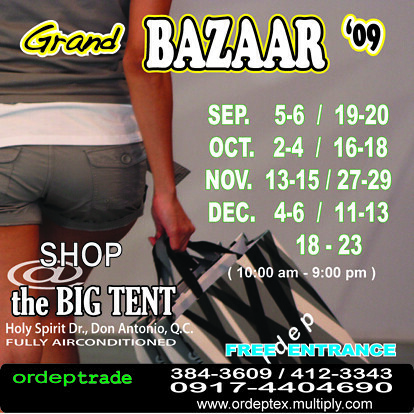 Giving of Raffle Coupons will be from purchases made starting October 1,2009 - November 30,2009. Deadline of submission of entries will be on November 30, 2009 at 9:00 pm. Note: P500.00 denomination of GC will be given. All GC’s are valid for One (1) year. Note: Customers will only be allowed to win one (1) prize for this promo, in case his/her name is picked twice, said customer shall be entitled to the bigger prize. 6. Prizes are transferable but not convertible into cash. 7. Winners should claim his/her prize 60 days from the date of receipt of notification. 8. Winners will be notified through registered mail and will be posted in all George Optical branches. 9. For GMA and/or Provincial winners, redemption of prizes shall be made at George Optical Head office located at 2005 G&B Bldg. Taft ave. corner Gil Puyat ave., Pasay City. Note: For provincial winner/s pertaining claiming of prize, the winner/s should be shoulder the transportation and other expense. 10. Winners upon claiming the certificate should present the claim stub, valid ID, and registered mail. 11. In case the winners fail to claim their prizes 60 days from the date of the receipt of the registered mail, the prizes will automatically be forfeited with prior DTI approval. BDJ Rendezvous: Your Confidence Check Up! Belle de Jour will be having another event especially for Belle de Jour girls on October 3, 2009 from 1pm to 5pm at Shangri-La, EDSA. This rendezvous will be a confidence check-up to all who will be attending. In this event, you will be putting beauty back on your to-do list, become inspired to take fitness to the next level as you learn about the niche sport of skyrunning and how it can take you to such great heights, and lastly, learn how to create outfits that exude head-to-toe confidence. Exclusive invites to the FIRST 60 Belle de Jour Girls to EMAIL and ANSWER two questions. 2) Choose any one of our brand partners. What’s your most memorable story with/about any of our brand partners? Answers should be limited to a maximum of 500 words per question. Email your answer to us at ilovebdj@belledejourpowerplanner.com. To all sneaker fanatics, its time to Get Funkitied! There will be a Trinoma Sneaker Nation Sale on September 25-27, 2009. Jump into exciting discounts on sneakers and rubber shoes at participating stores in this groundbreaking sale!